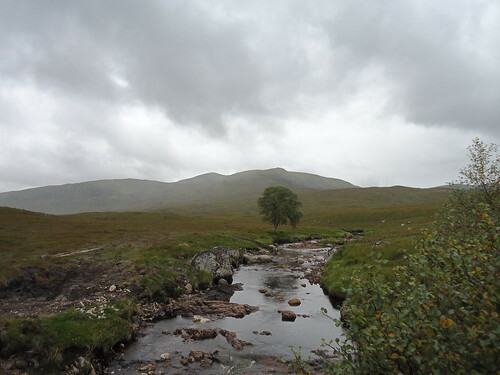 It was back in April, at the height of my craze for planning big multi-day expeditions to complete this summer, that I originally conceived of the possibility of taking in all my uncompleted Munros between Loch Ericht and Laggan in one trip, linking Rannoch and Tulloch train stations. At the time it was another of my unrealistic crazily dreamt-up notions, one that I knew I was never likely to complete, never mind attempt. However, having been building up my fitness over the last few weeks, with my last remaining two-day window before late-September (when the days would be significantly shorter) and poor weather forecast for Friday and the weekend, my idiotic idea became reality. 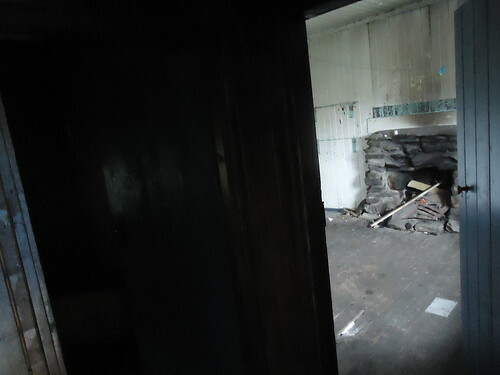 My plan, as originally conceived, was to tie to two stations together in a three-day trip, perhaps using some of the bothies in the area. However, as I compacted and refined my route, it became apparent that perhaps this was manageable in two days (an idea I would perhaps come later to regret!). 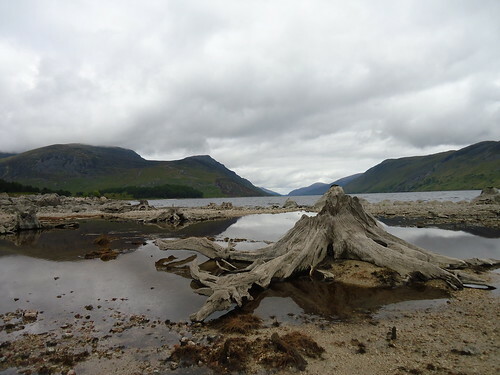 The first day would start at Loch Eigheach, take in the Carn Dearg - Sgor Gaibhre - Meall na Meoig horseshoe, before following Loch Ericht along to Ben Alder cottage, from where I would climb Beinn Bheoil and Ben Alder, before descending via the Long Leachas ridge and camping near Loch an Sgoir. 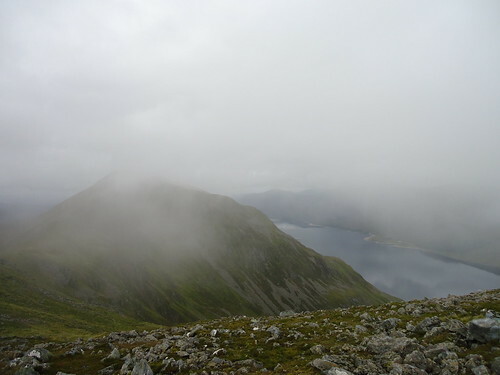 The following day, I would climb up onto the ridge between Carn Dearg (Loch Pattack) ridge, traversing it all the way along to Beinn Eibhinn, before dropping down to the western end of Beinn a'Chlachair. 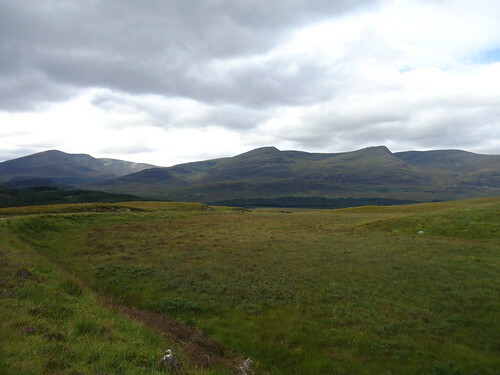 From here, I'd walk the length of the Beinn a'Chlachair ridge, then pop up Geal Charn and Creag Pitridh from the bealach, before heading down to the Laggan road and along to Tulloch station. 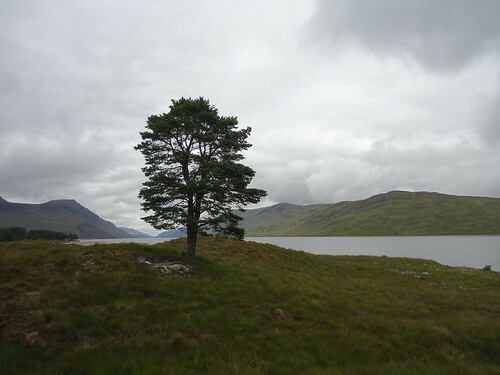 Then it was simply a matter of a short (theoretically) stroll from Rannoch station back to Loch Eigheach. 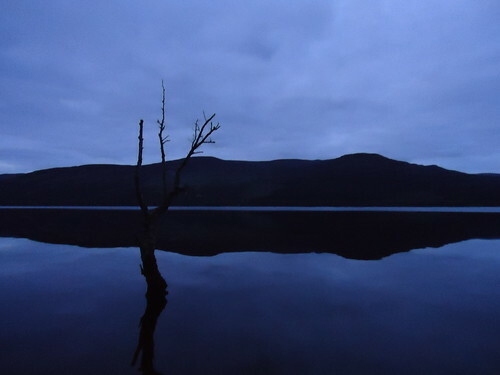 So, at 6.30am on the 31st August, I found myself setting off from the car at Loch Eigheach, having had some cracking pre-dawn views along Loch Rannoch. 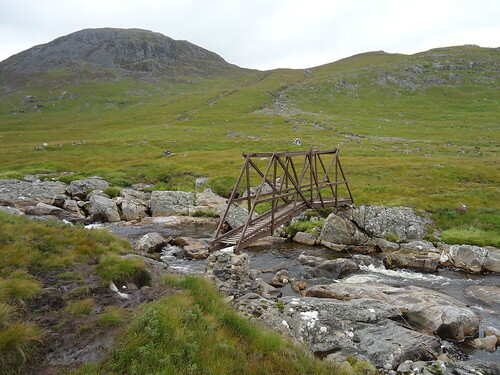 My rucksack was taking its toll within half an hour of trudging up the track past Sron Smeur, so I was considering my options for making it a one day walk instead (i.e. returning to the car after the first horseshoe). Similarly, my feet were soaked through within minutes of leaving the main track, as a result of persistent drizzle and wet grass (damn you, Gore-Tex boots!). My feet were to remain soaking for the entirety of the day. All-in-all, not a particularly encouraging beginning to the trip. 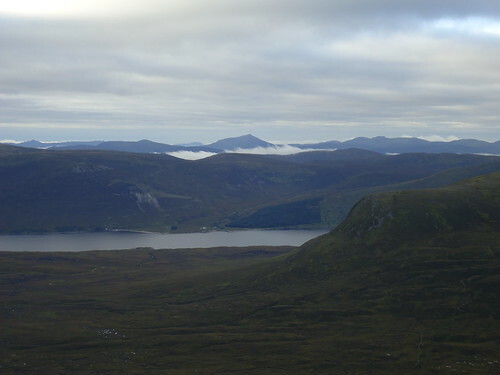 As I gained height and climbed out of the mist on the long Carn Dearg ridge, the views around began to open up - Blackwater to the West, Schiehallion and the Glen Lyon hills to the South and East, and across to the rest of the horseshoe. 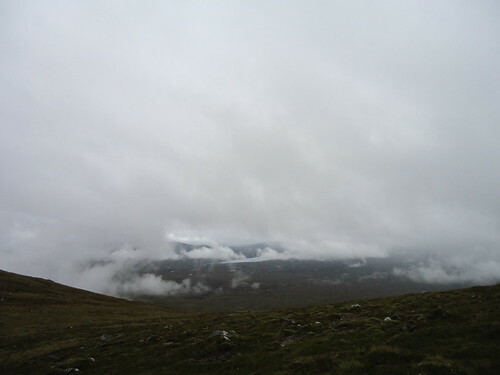 Unfortunately, however, the cloud and drizzle returned for my arrival on the Carn Dearg summit, so my mid-morning snack was enjoyed without much of a view to accompany it. 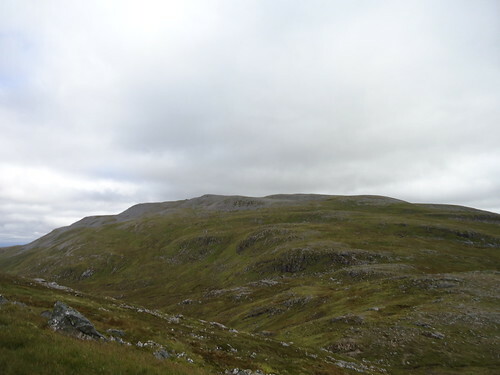 The route to Sgor Gaibhre, my second summit, was a very straightforward descent to, and ascent from, a grassy bealach. I descended out of the cloud, and could see, through wispy morning clouds, into the rest of the Alder forest to the North, and around the rest of the horseshoe. 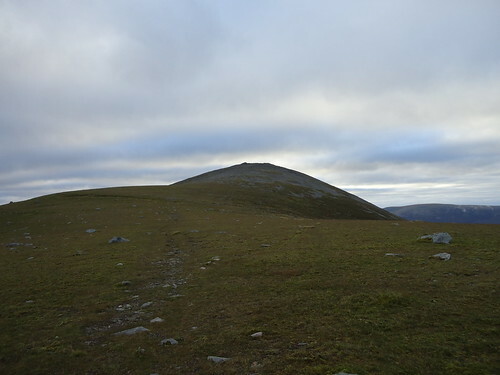 By the time I reached the summit of Sgor Gaibhre, I was in the sun, and could see my route for the next few hours ahead of me. 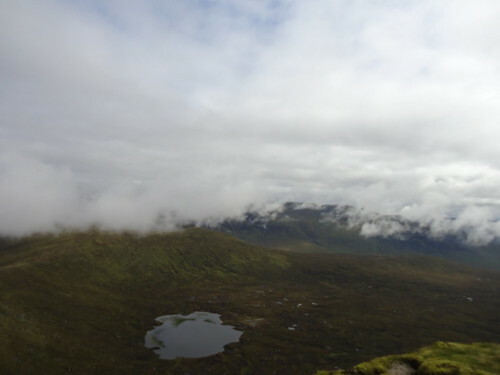 The connecting ridge with Meall na Meoig was pathless and lumpy, with a low bealach in between, so it took longer than I perhaps expected to reach the Corbett summit, which is marked by eerily smooth crags and a nice wee Lochan. 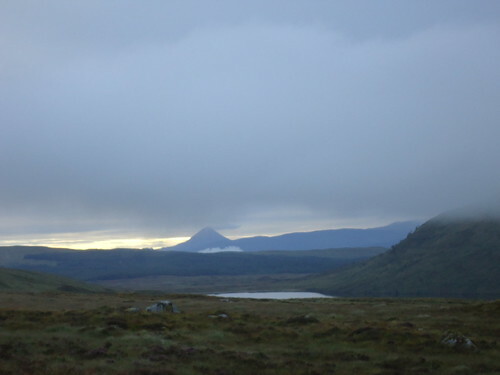 This was the point at which I could potentially have continued back to the car, but after very little deliberation I decided to go for it, and plunged into the depths of the Central Highlands. 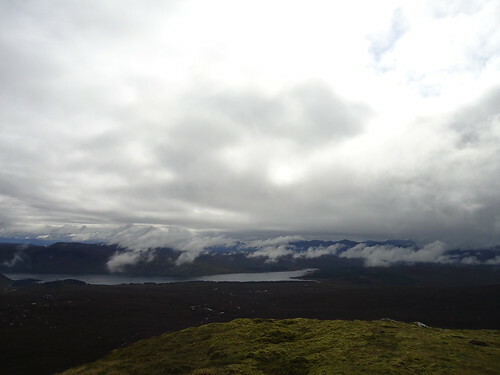 It was a fair trudge down to Loch Ericht from the Corbett summit, along a fairly steep ridge of wet grass, then across heather and bog to the shores. 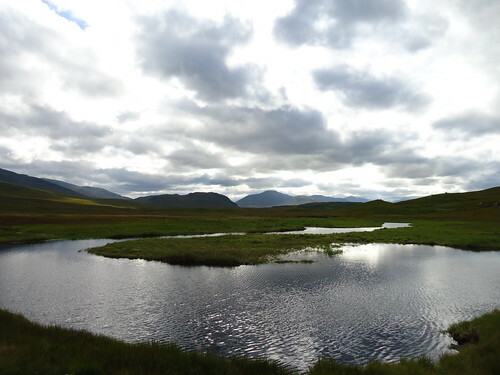 However, once I reached the Loch, there was a big bulldozed track leading most of the way along the Ben Alder cottage, with some cracking views along the way. 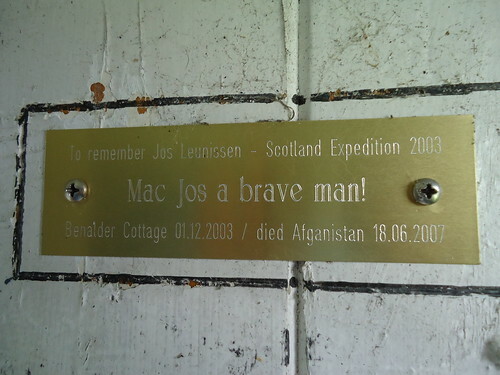 Reaching the cottage at 1pm, I had a my lunch and a wee nosey around. Now, I reckon, I had done more than half of the day's distance, although I still had great deal of ascent ahead of me. 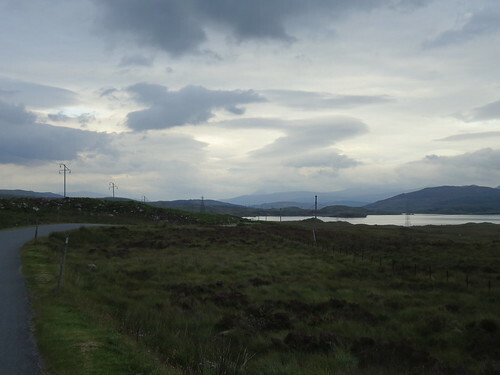 The pull up to Bealach Breabag was a real killer, with a fairly poor path tracing the river up. 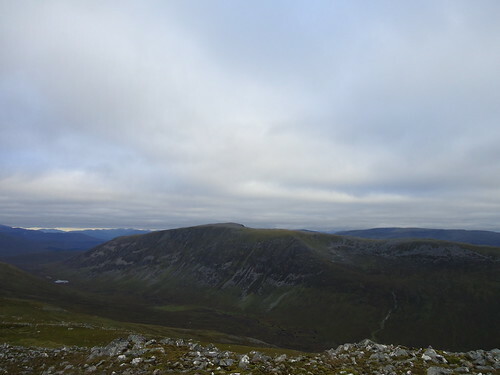 However, upon reaching the bealach, I was rewarded with the knowledge that, firstly, I had now completed most of the day's ascent and, secondly, that I could walk without my heavy rucksack for the first time in the day, leaving it at the bealach. 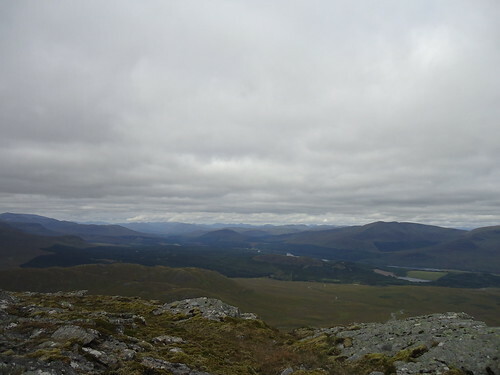 I'll admit, it was a very strange feeling walking up Beinn Bheoil without the (literal) weight on my shoulders - as if someone had suddenly gotten rid of the gravity that was holding me to the ground. A nice feeling, nonetheless! 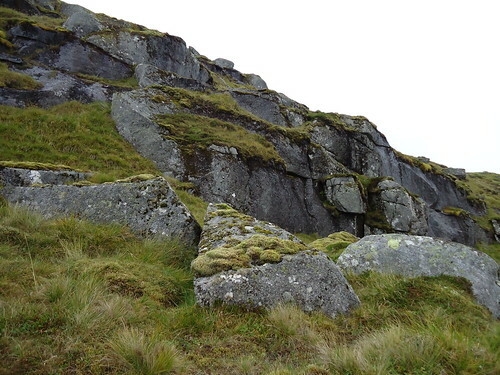 A bouldery route led up to Sron Coire na h-Iolaire, from where an easy path led across to the Munro summit. 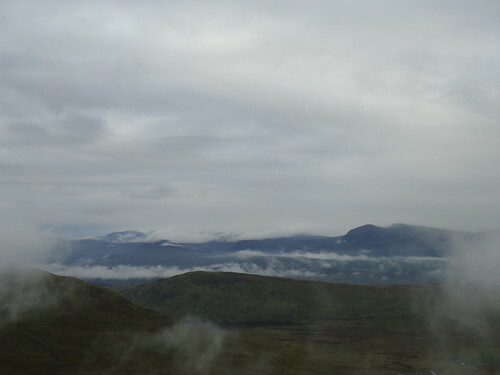 The strange, wispy cloud that I had seen in the morning was still present, and from the Beinn Bheoil summit, I could see nothing around me except occasional glimpses of the Ben Alder massif and the down to Loch a' Bhealaich Bheithe, where I saw the first other human being of the day. I've finally got it off! 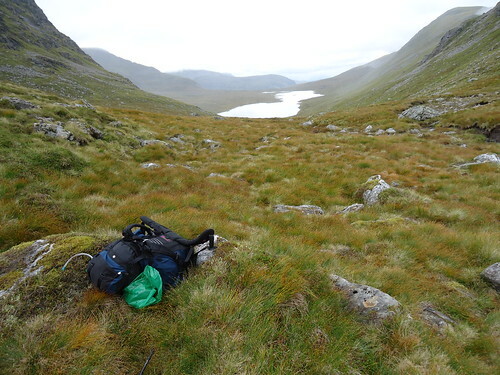 So, returning to the bealach and, grudgingly, my rucksack, I was now faced with my last serious ascent of the day - up onto the Ben Alder plateau itself, towards the highest point of my expedition. The ascent was a fairly grueling ordeal, although it was over soon enough. 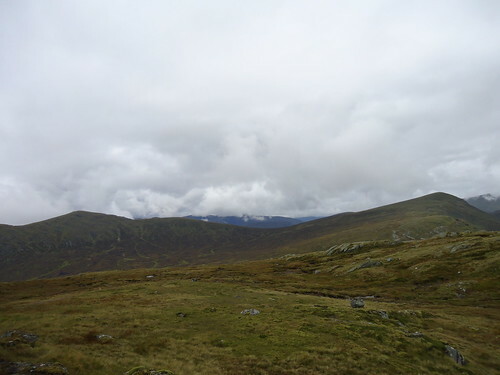 The plateau was largely bathed in cloud, but the summit was reached easily, with a new energy in my legs arriving with the knowledge that the day's ascent was largely over. 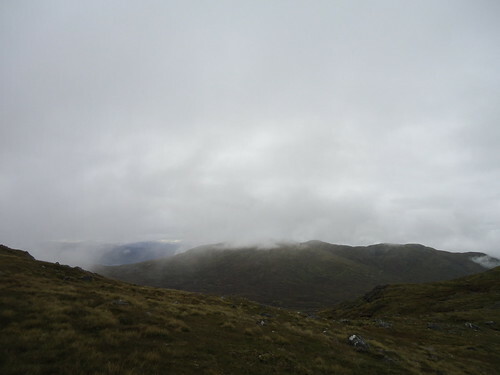 The summit itself was completely shrouded, although this didn't inhibit the elation I felt upon reaching it. It was 5.30pm by now, so I kept moving to be sure I was off the massif before the daylight disappeared. 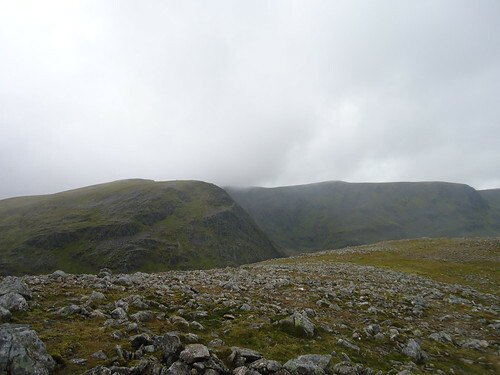 I had briefly read about the Long Leachas ridge on a few walk reports and guidebooks, and I had the impression that it was a fairly easy-going ridge walk, with the main scrambling saved for the Short Leachas. However, upon reaching the top of the ridge, I felt a sudden uneasiness - the 1000 foot drop on either side a daunting affair. 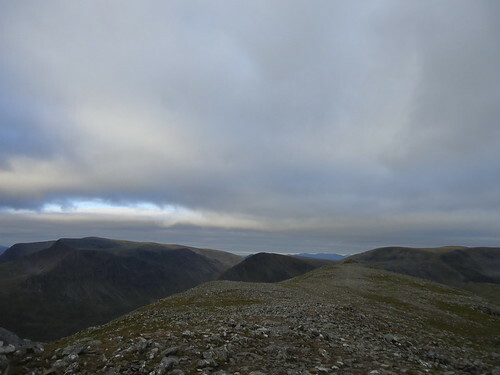 It was at this point that I questioned the wisdom of continuing on this route - the alternative would have been to descend via the Ben Alder West ridge, and make alternative camping arrangements. However, in true foolish, cavalier attitude, I started off down the Long Leachas ridge. 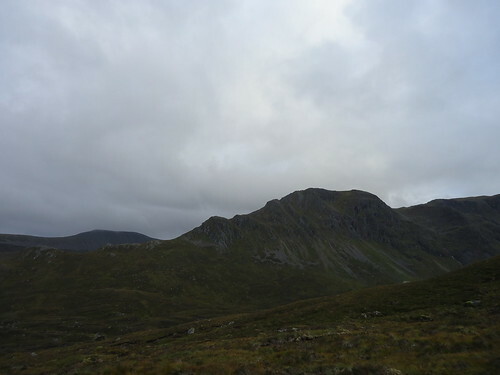 There was a great deal of exposure on the top section of the ridge, and the greasy rocks (as a result of the drizzle earlier in the day), heavy rucksack offsetting my balance, and lack of tread on my boots made it all the more difficult. Saying that, the path was obvious, although I certainly wouldn't recommend it for descent in those conditions. 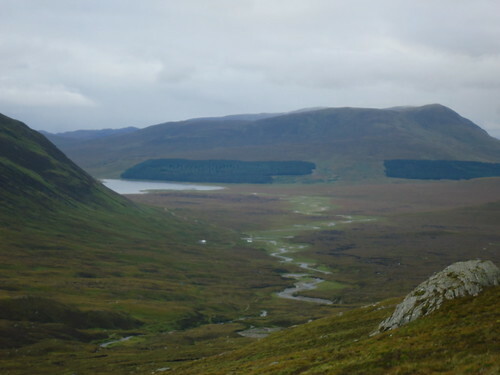 It was after more than an hour of careful negotiation that, with tremendous relief, I reached a point from which I could descend down grassy slopes off the NW of the ridge, towards the Allt a' Bhealaich Duibh. I could see now that easy walking terrain should not be taken for granted - make the most of nice grassy slopes! I had conked out by 9.30pm, all set for a 5am wake up call and another big day. I woke up not to the sound of my alarm but to the sound of some ptarmigan honking nearby. However, being 4.55am, I decided to be courageous and get up a whole five minutes early. 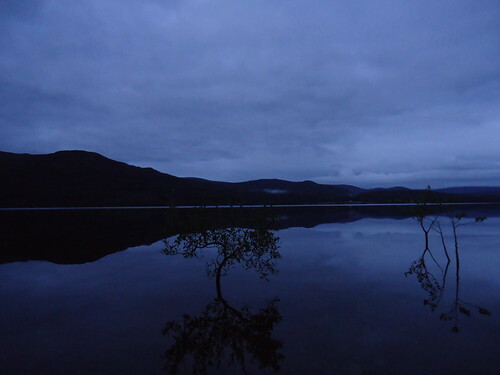 Some headtorch-lit burnt porridge for breakfast got me in the mood (almost) for the trek ahead, but putting my sodden socks and boots back on was perhaps the lowlight of the day. Nevertheless, it had to be done, and I was walking again by 6.45am - aiming for the bealach on the ridge between Geal Charn and Carn Dearg. The rucksack was really taking its toll on my shoulders now - I could no longer lift it with one arm, due to my knackered shoulder muscles. However, part of the reason for doing a one-way (as opposed to a loop) route in the wilderness was that I would have no choice but to continue, so would have to complete the route! 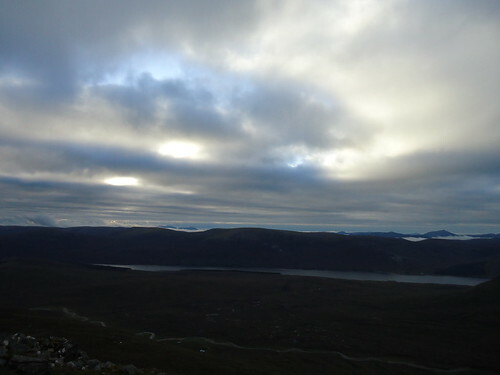 I dropped the bag at the bealach, gaining my first views of Beinn a 'Chlachair, Creag Pitridh and (the other) Geal Charn to the North, and reached the Carn Dearg summit by 7.35am (my earliest ever summit!). Some decent views back to the Ben Alder massif and further out East across Loch Ericht to cloud-filled glens made the short walk to the summit more than worthwhile, and from here it was a leisurely walk back down to bealach (the last time my shoulders would have freedom for quite a few hours). The remaining three summits on the ridge fell like dominoes - a fantastic curving and undulating ridge walk with some great aretes and corries - reaching the summit of Beinn Eibhinn just after 9.30am (the first time I'd ever summited my fourth Munro of the day before 10am, and presumably the last time too!). 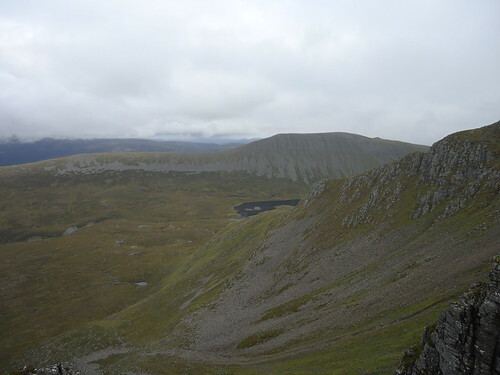 From here I could see back to my first summits of the expedition - Sgor Gaibhre and Carn Dearg. It seemed like day's since I'd been up there, although it was in fact less than 24 hours. My aim for the day was to reach Tulloch station for the 8.30pm sleeper service that could take me back to Rannoch. 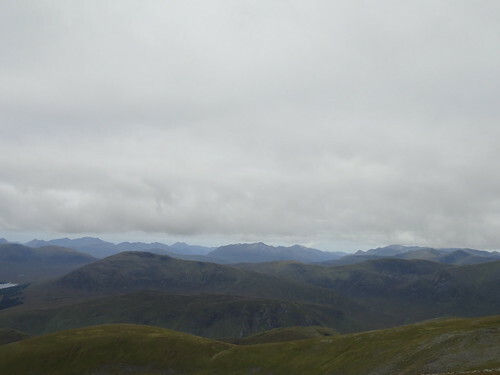 Working backwards, I figured that this meant being off my last summit by 4pm, so summiting Beinn a' Chlachair by 1.30pm at the absolute latest. 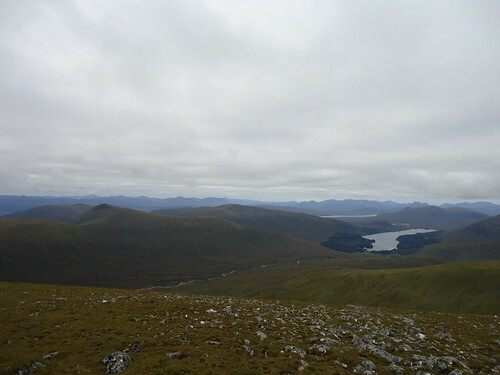 My option at the Beinn Eibhinn summit, if I didn't think this was feasible, was to cut down to Loch Ossian, and along to Corrour station. 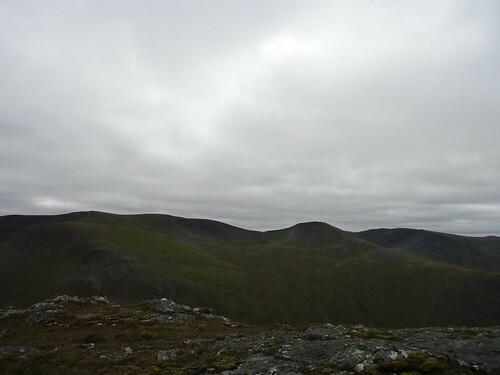 The ascent of the Beinn a' Chlachair was perhaps the toughest climb of the day - up an endless grassy and boulder-strewn ridge with various false summits - not greatly encouraging when I was pushed for time. I reached this summit bang on 12 noon, however, and I felt a sudden optimism about being able complete the route in time for the train. 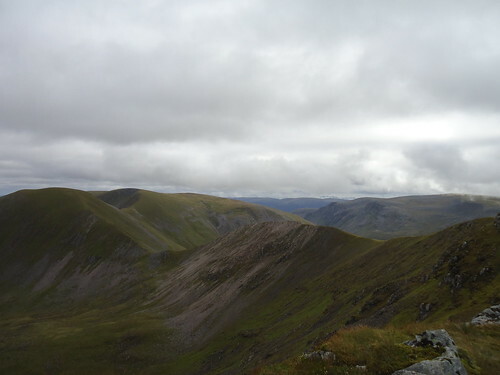 Taking a well needed lunch break, I could see most of my day's walking laid out around me - my two remaining Munros, Creag Pitridh and Geal Charn, to the North and the Carn Dearg - Beinn Eibhinn ridge to the South. Following a faint path to the subsidiary summit (977m) East along the ridge, I kept an eye out for a marked path off the NE side of the ridge. However, I had no hope of finding it, so I negotiated my way down fairly steep (but, this time, not exposed!) grassy banks, eventually meeting the path as the slopes became gentler. The modest ascent below the Northern crags of the ridge seemed surprisingly difficult - my legs now beginning to feel the effects as well as my shoulders. 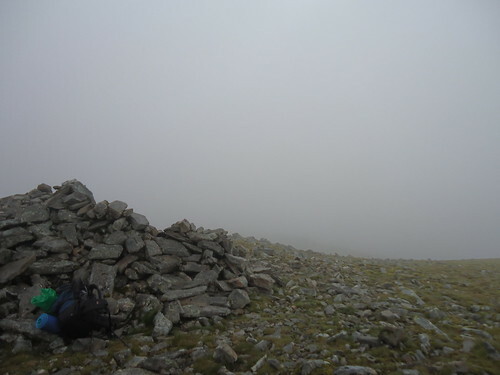 Fortunately, this was the final ascent with my rucksack, so my willpower managed to hold out (just). 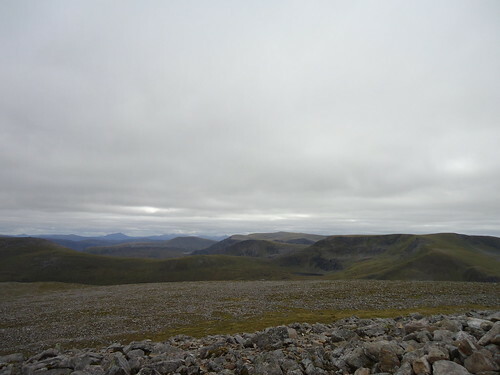 Upon reaching Bealach Leamhain, it was only a short walk North to the Geal Charn - Creag Pitridh bealach. 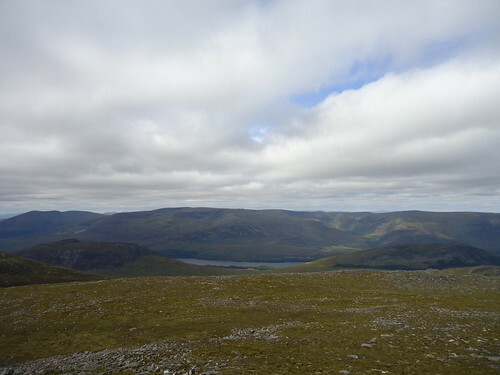 From the bealach, after a bar of Asda's Milk Chocolate (which, again, is a real treat) and dropping my rucksack, I summoned one last blast of leg power to climb the fairly short, rocky ascent of Geal Charn. My feet were beginning to give way here - having been submerged in water for more than a day, they were beginning to wear. 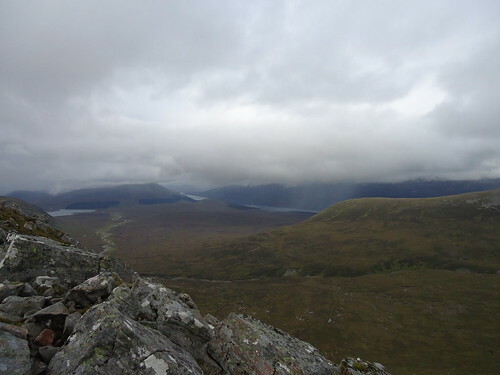 I reached the summit within 25 minutes, and could see right back to much of my expedition - the Ben Alder massif, Loch Ericht, the Aonach Beag ridge, and then across to Loch Laggan and (NO WAY! ), Tulloch Station. 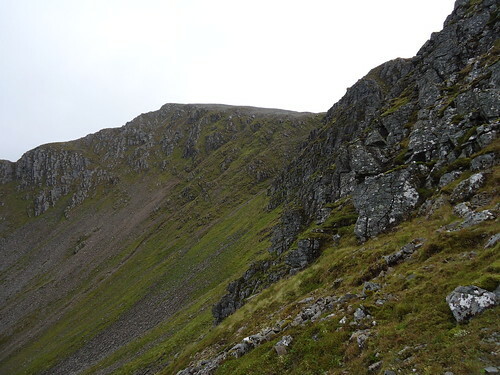 Nipping back down to the bealach, it was only a 10 minute walk to the Creag Pitridh summit, a top somewhat dwarfed by its much larger neighbour, but an interesting summit lump nonetheless. Upon reaching the summit, and getting a blast of wind to the face, I felt an intense elation at having completed the route - an idea that, 5 months ago, was a unrealistic dream, but that had now become reality. 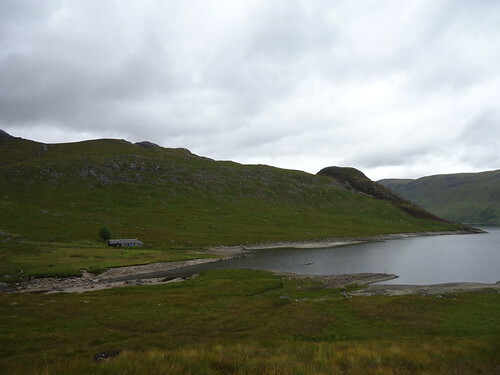 Returning to the bealach, which I reached at 2.45pm, with new pains gradually appearing on various parts of my feet, I set off on the long haul to the Laggan road. 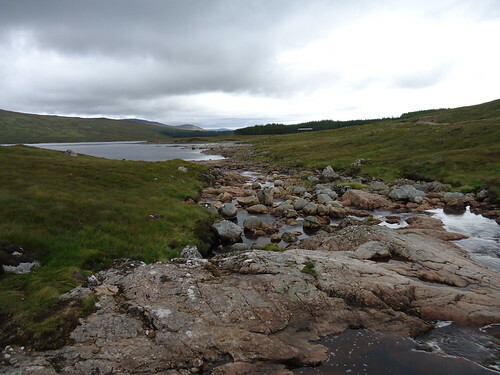 Although the path was easy to negotiate, turning into a landrover track near Lochan na h-Earba, I was relying on my arms and poles to keep me moving, my feet by now in a lot of pain. The uncertainty of how long it would take to get along to Tulloch station made me keep pushing, to be sure I could make the last train. 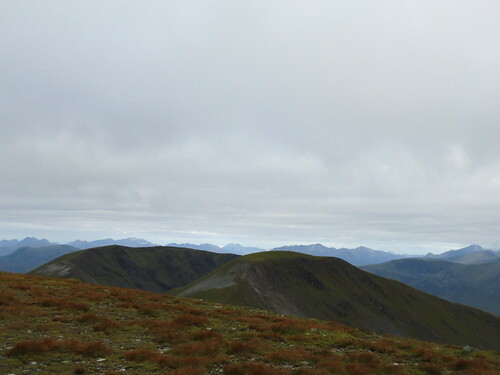 However, it seems that, following my summiting of the last Munro, my body decided to give up, so various muscles began to really fatigue. Reaching the Laggan road at 5pm, which was earlier than I had planned for, I set off along the road - approximately an 8km walk to the station. I thumbed any cars that came past, but the nature of the road (and heartlessness of the passers-by!) meant that I was ignored. However, about 30 minutes along the road, a wee white VW Golf pulled to a stop 100m infront of me. All of a sudden, my body stopped aching, and I ran towards the car in a kind of Hollywood-style slo-mo fashion. The guy that picked me up worked for an outdoor access company in Fort William (I would endorse his company as a thank you for the lift, but I have no idea what it is called!). 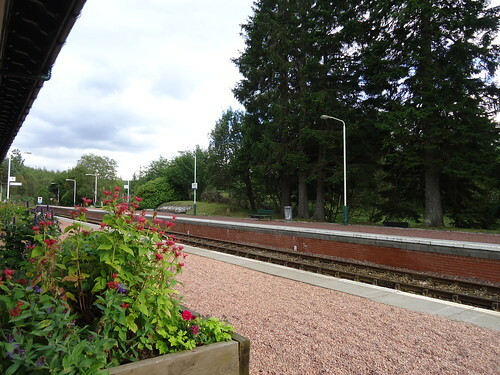 As it turned out then, I reached Tulloch station at 5.40pm, just in time for the 6.08pm service to Glasgow Queen Street! Score! 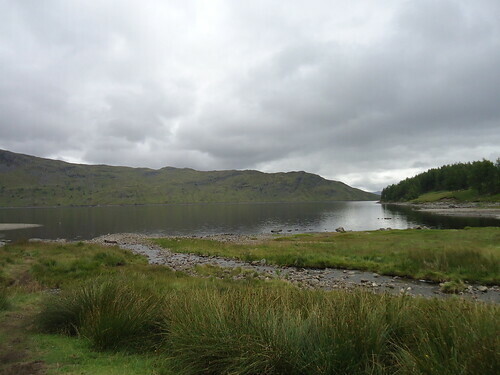 The train journey took me past a few of the hills I had been living among for the last 36 hours and, reaching Rannoch station around 6.40, I only had a 2.5km walk back to Loch Eigheach. This was tough though - my muscles and feet suffering having just had an hour's rest. Still, I made it back to the car not long after 7pm, 36.5 hours after leaving it. All-in-all, this was by far the greatest physical challenge I have ever been put through. At home today, I am struggling to get up and down the stairs, and I can't sleep on one side due to muscle bruising! Still, it is worth the aches and pains for the sheer satisfaction of having completed the challenge that I didn't think was possible, conceived of in a haze of ambitious route-planning in a student's bedroom 500 miles down South. Last edited by joenorris on Thu Oct 13, 2011 3:23 pm, edited 10 times in total. What a great report from a great effort. You have every right to feel sore after that. I only did the last 3 of yours in one day and my legs were tired. Well done. A report of the month already me thinks. Nice one bro, I fancy a biggy like that end of Sept...Mullardoch circuit? 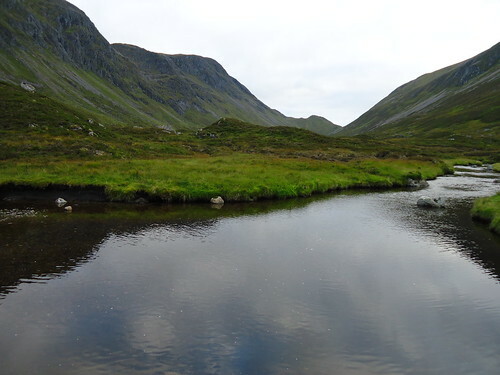 Malky - it seems to be a decent area for trying different combos of hills from different directions, exploring the hidden glens and lochsides etc, I think I may go back in the future and try some alternative routes, just like your route. 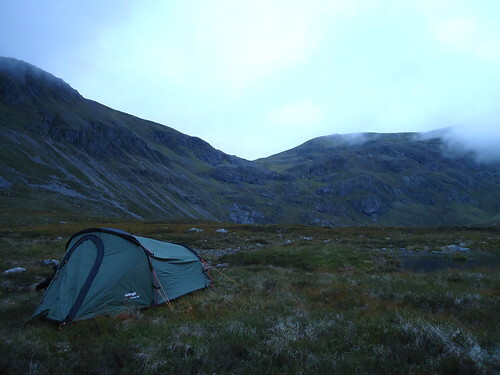 Ben - Mullardoch circuit sounds brill, it'll be a treat to share the camping/cooking gear weight out a bit! A wallk of epic proportions. No wonder the muscles were shutting down near the end Inspirational. Cheers Monty, I see you're partial to a big round yourself. As I say, my legs are having a few weeks to recover now! Cheers Johnny, glad you liked it. Inspiring report...thats what we're talking about. Gets my vote any day. 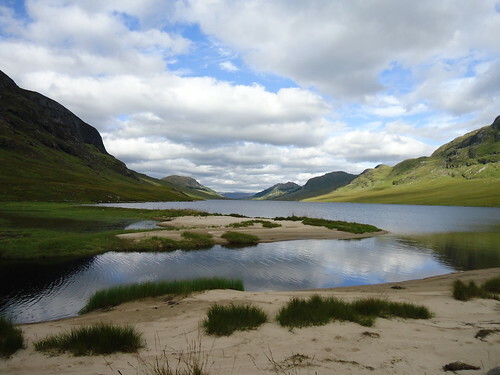 The photo of Lochan na h-Earba is just quality. Gonna have to start using the tent that lies at the bottom of the wardrobe. some amazing pictures!!! Enjoyed the report, well done you! Cheers guys - I appreciate the feedback. Amazing Joe,well done for finishing this monster route. Brings back some great memories for us that did! We did a 3 day trip in those hills about 18 months ago,amazing. Have a look through my walk diary if you wish.